All classes are taught by Valerie Green and Dance Entropy company members. 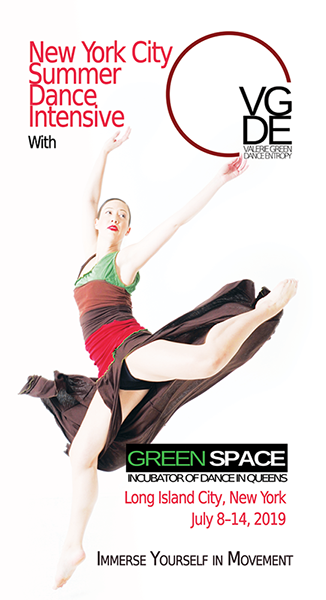 This intensive at Green Space is open to all dancers, choreographers, actors, directors, and movement lovers of every kind to gain hands on individualized, professional training. Class begins with a series of floor exercises designed to awaken the feet, spine, center & pelvis. Next, standing center work focuses on technical exercises supported by proper alignment. The class culminates in rhythmical, full-bodied across the floor movement combinations that incorporate the use of turns, jumps, working in & out of the floor, detailed gestures, & diverse dynamics.The principles emphasized in this class are universally beneficial to dance training & include using the power of the center to initiate, control, & radiate movement, plus pelvis initiation, & the use of under & over curves. Informing this class is Green's certified background in BodyMind Fitness. Exercises are guided with the safe use of body mechanics & neuromuscular imagery, highlighting movement that follows the logic of the body's innate spirals & bone rhythms. This workshop shares valuable creative movement exercises & tools that stimulate the mind and body to generate movement ideas. The artists will be in a nurturing environment where they will be guided to discover their own unique movement conceptions. This class will allow modern dancers to explore the principles of ballet in a non-threatening environment while translating how the forms study can enhance & support modern dance technique. Valerie Green will direct & shape a short work pulling together the week’s phrases, explorations, & choreographic studies. This workshop allows the opportunity for intensive participants to put new skills learned over the course of the week into action while working on performance quality. This work will be performed in the intensive’s final showing. Utilizing the ancient tradition of yoga, this class uses breath & stretching to support healthy body alignment. A fantastic cross training for the mind & body that can easily be applied to all dance techniques.